To paraphrase Mark Twain, “The rumors of Desert Lake County Club’s death have been greatly exaggerated.” For months, rumors have circulated that things at DLCC were in disarray. Would it stay open? Would it still hold NSCA-registered events? Was this year’s Desert Lake Classic still on? I’m happy to report the answer to all three questions is a resounding "yes." Located in Boulder City, Nevada, Desert Lake is a welcome reprieve from the crowds, bright lights and congestion of nearby Las Vegas. 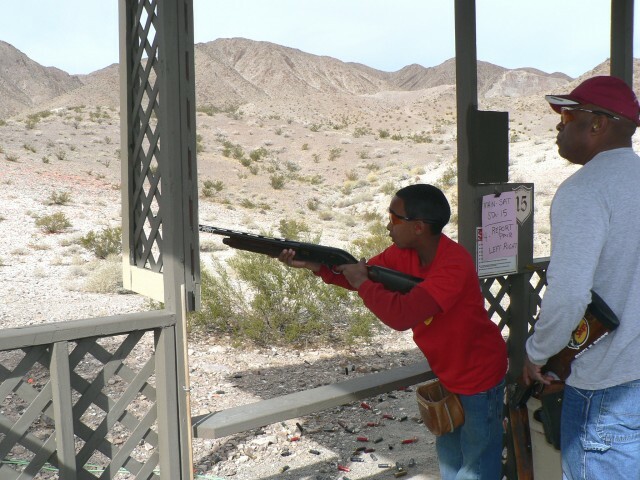 With its desert terrain, arid valleys and dry washes, the club is able to create some unique target presentations not normally associated with sporting clays. To ensure that everything ran smoothly at this year’s event January 27-29, Dan Mitchell of Mitchell's Clay Target Sports was hired as tournament director and main target setter. For Mitchell, this was a homecoming of sorts -- he was the tournament director four years ago at the first Desert Lake Classic. Utilizing DLCC’s varied terrain, Mitchell, Brooks Robison and Wally Richardson were able to set up two challenging courses for the main event. In addition, they set up a 100-bird preliminary, a 100-bird 5-stand and three 50-bird sub-gauge events. It is not enough to want to win. It is not enough to prepare to win. To win, you must act, execute decisively, with utter conviction, believing that if anyone can break this target, it is you. Which bird of a pair you take first—and when and where in its flight path—can make a huge difference in how easy the second bird is to break. Sounds simple, but the devil’s in the details. A Gould’s gobbler deep in Sonora, Mexico, completed the author’s decades-long quest to collect all six species of North American turkeys.